If you want more leverage in your trading activities, then you should learn to trade futures. Given the present requirements, an investor only needs about one dollar out of every fifteen in order to control a futures contract. You can make a profit on an instrument that is much larger than your cash supply. Commodities and stocks are also available as futures contracts. They are available to investors at every level of the market, whether they are independent day traders or investors at large investment houses. Anyone can learn to trade futures and profit from it. A big advantage to trading futures is the liquidity involved. A futures contract has a great deal of liquidity because it can be traded for cash at almost any time before the date of delivery. 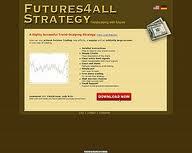 The market for futures is so huge that there are always investors ready to buy them. After you learn to trade futures, you will also enjoy the low commission charges and the high level of transparency associated with this form of trading.